Meet 18-35's on this 3 day, 2 night Fraser Island Tag Along Safari! Backpacker tour, great for meeting new people! 20 people for fun, social trip! 3 day/ 2 night Frasers on Rainbow Tag Along will give you a great adventure, while meeting like-minded people. With excellent local knowledge, amazing lead drivers and comfortable 4WDs, Frasers on Rainbow are a leader in fun, adventure filled tours around the magnificent Fraser Island. The tag-along system allows you to get around the island safely and see all the amazing sites, with the added advantage of a lead guide to ensure your safety and provide excellent knowledge of the island. Add 2 or 3 nights accommodation at Rainbow Beach if you want to stay for longer! Champagne Pools - Take a cool dip in Queensland's natural jacuzzi! 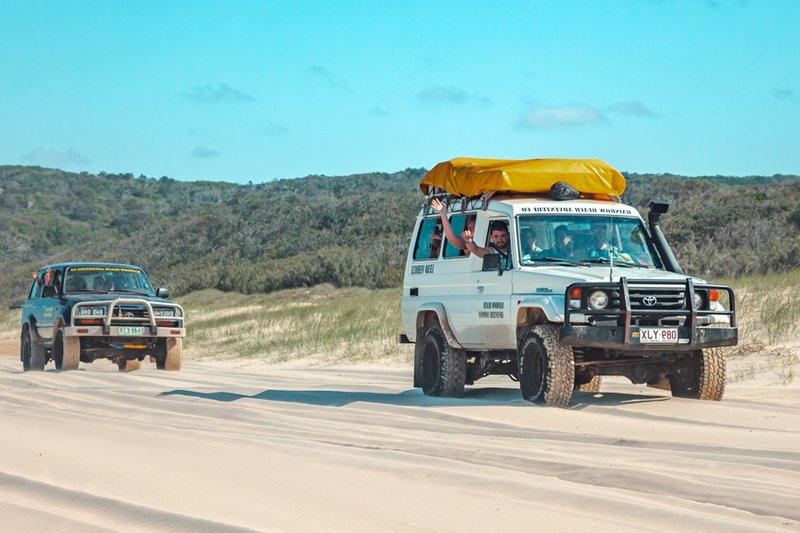 Your tour starts from the day before you head out to Fraser Island, the compulsory safety briefing occurs at 4pm the day prior and gives you a comprehensive overview on safety features whilst touring the island along with some useful hints and tips on driving on soft sand. This briefing lasts for approximately 1.5 hours and this is when you will be split into your vehicle groups and get the chance to meet other travellers who will be touring with you. The morning of departure we will split you up into your groups and ask you to work together in checking off all your food to make sure it is all there before you go. You will pack your food into the eskies, alcohol into cool boxes, do a full vehicle inspection including checking all camping and cooking equipment is provided and then do a full driver briefing outlining the most important aspects of driving on soft sand and how to use the gears. Then it's off you go!! You will only set up camp the one time and travel back to this area every evening so you can sit down, relax with a drink and cook your evening meals without the hassles of having to relocate every time. On the third and final day you will arrive back into Rainbow Beach approximately around 3.30pm (depending on tides) where you can enjoy a few drinks and some food with friends at our on-site bar and restaurant. Our bar hosts nightly entertainment with everything from live music (Tuesdays, Thursdays and Saturdays), Karaoke and party games with awesome prize giveaways. Take advantage of our happy hour prices and our $10 belly buster meals daily from 6-8pm. On the morning you depart after your tour, we have a free luggage room for your bags if your bus does not leave until later in the day, unfortunately we cannot offer late check outs. In order to be able to drive on Fraser you must, be over 21 years of age with a full open manual drivers licence and you must have this licence with you on tour. All client cancellations forfeit 25% of total ticket price and all client cancellations made less than 21 days prior to departure will result in complete forfeiture of the full price of their tour. If the tour company has to cancel the trip (prior to the tour's departure) and we cannot offer a suitable alternative, then a refund will be given minus card fees. We strongly recommend that you have travel insurance, especially during the wet season. "We were collected by our tour guide John promptly as arranged.. John was very knowledgeable and chatted in depth about Fraser island.. a big thank you to John.. we swam in lake McKenzie wonderful experience crystal clear water.. we stopped at several stops including twice to dine.. we did stop a third time at the restaurant but only for 10 minutes would have been better if we stopped for 20 minutes .. Would definitely recommend the tour.. we all had a fabulous time. "